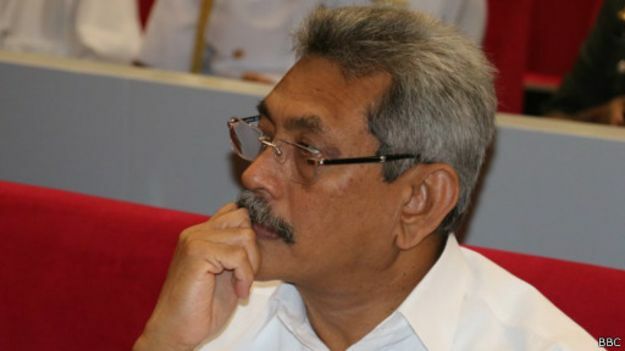 A pathetic Gotabaya Rajapaksa appeared before the Financial Crimes Investigations Division (FCID) on Wednesday and sold down the drain people who worked for him. He pleaded he was clean and not guilty of any offence. The first part of the questioning, which went on for a total of six hours, was on the procurement of MiG-27 fighter jets for the Sri Lanka Air Force (SLAF). A nervous Rajapaksa, his hands shivering, said the purchases were done in a proper way. When subjected to deeper questioning he said the person responsible for all those matters was Air Marshal Roshan Gunatileke, who was the Air Force Commander at that time. Gotabaya said that the former Air Force Commander was responsible “if there were financial irregularities.” He said he was not to be blamed for that. He said people should realize that the war was won because these fighters were there and there should not be any investigations into these matters. In the process Gothabaya forgot that as then functioning Secretary of the Ministry of Defence, he was the Chief Account Officer and was responsible for all financial transactions. He was also questioned at length on manipulation of shares at Lanka Hospitals Limited, the former Apollo Hospital. There his close friend and front man Dilith Jayaweera had allegedly manipulated shares to go up from Rs 28 to Rs 64. It was thereafter that the shares were sold to an Indian company. Jayaweera had obtained inside information from another director of Lanka Hospitals, Nalaka Godahewa. Both Jayaweera and Godahewa were directors of George Steuarts Securities which were trading at the Colombo Stock Exchange. FCID will now question Godahewa. When the questioning was over Gota was shivering with nervousness. He called one of his security officers and ordered that his vehicle should be reversed inside the FCID premises so he can avoid the television cameras and media. The men did so and the one time powerful and power hungry Gota, now left helpless and exposed for alleged corrupt activity, left without facing the media. If he is so clean as he claims, why did he not face the questioning and avoid the media asked an onlooker. The onlooker said Gota thinks he is still wielding power and trying to cover up matters. That is why he sought a Supreme Court order. if you do have one. to work as a security guard – I repeat security guard. Working as a security guard is not a disgrace. If you have served even a quarter as much as Gota has for this island of ours, then I would buy a hat so I could take it off to you. If you think that the medals of honour for bravery in the armed forces are on par with how JPs are given that title, I take it that your sense of humour has got the better of you. You are entitled to your opinion, Old Soldier, as I am to mine. It is not a disgrace as long as its an honest day’s work for an honest day’s pay. However it is a disgrace to work for Sri Lankan armed forces and police both of which had committed war crimes since 5th April 1971, especially under Gota’s leadership. I don’t know what planet you come from. But for us Sri Lankans Gotabaya will be a hero who helped to save the motherland. Why don’t you keep your vicious thoughts to yourself? Why does it matter whether he worked as a security guard? Are you putting their profession down? Maybe he couldn’t take the fact that when the previous leaders scarified our army soldiers & left. You should get your facts checked before putting them out! You asks the question why gotabaya did not face the media. and then you yourself gives the answer. You have to say you assume, becauase you assumed. you also says onlooker said “….. In usa so and so tell this has no valid. Please learn. The man who was cleaning urinals in Los Angeles, is now rearing sharks in fish tanks in his mansion in Colombo 7. His wife transports puppies in Sri Lankan Airlines, cost free and the public like donkeys support these people for packet of rice. When he appeared on hard talk, he was speaking to Stephen Sackur as if he was the owner of Sri Lanka – such was his arrogance and the power at his command. I am surprised why the corrupt leeches in the Sri Lankan Supreme court did not protect him over a 5 year term. These judges are still enjoying the excreta dished out by the former regime. There is no traitor who is second to him. His argument does not hold water, as he never thought about his plight when he was drunk in power. Why did he not think and say this before, and support the Army Commander Sarath Fonseka and prevent him being sent to jail. He did not and he was against the army commander and worked hard to see he ended in jail. So how can he seek leniency for himself on the grounds of being a war hero when he was behind another war hero being incarcerated in jail. Gota stopped [Edited out] using FCID to arrest political opponents on false charges as a part of “GAWAPALANA” film acted by Chaura Rejina+ [Edited out]+ Pumbaya. To witness , what he did to Colombo and what YAHPLANA did to Colombo, go and see video given in LanakaCNews. If the press were not allowed in to hear the evidence where did the writer get the information from? Very suspicious ! It’s always the press’s view that should be taken as evidence, right? evidence when Prabhakaran was killed. US Navy seals killed Osama Bin laden? Reversal of fortune, Gotabhaya becomes Bayagotha. He is trembling because he can not make other people tremble anymore at least for the time being. Sooner he is put away for the crimes he did so much the better for us as a society that was held at ransom. Cant believe that the man who was once the father of the Grease Yakkas has now wet his pants. Isn’t this the same hero of some dumb people in SL (& outside SL) who valiantly fought the LTTE as a family sacrificing other people’s children by hiding in a bunker in Colombo? The same hero who never feared the LTTE is trembling in front of investigators with a pen? It simply amazes me how nutbags like Sumanasekeram, David Blacker, Sach, Rabok, Taraki and few other wing nuts hold the HoraPaksas up so high? This ex-petrol station cashier is a hero? Can someone enlighten me please?